The past few months I have been stalking on a brilliant group of foodies, whom I admire for their wit as well as their mad cooking skills. It is a small group but intimate, exactly what I prefer. They come together once a month for “Let’s Lunch.” I quietly read their tweets about lunching and then slowly but eagerly open the doors into their sites, taking in whatever their monthly lunch challenge was. I was pretty excited when Elise, the Cowgirl Chef, pinged me with an invite. I could not wait! What would the lunch challenge be? Would they like me? It was silly, but, I was excited. The lunch event for February is in honor of Chinese New Year and we were to make something with a lucky food. I researched lucky foods, high and low until I found one that I felt would bring something to my life as well as being special for this group. I went with Noodles. 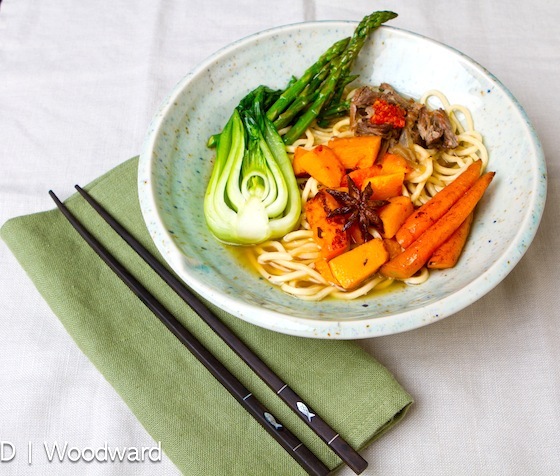 You see noodles are often considered a symbol of longevity in the Chinese culture. Noodles signify a long life to the person who is slurping them up. The noodles can never be cut as it is believed that it would be back luck and shorten one’s life. As well when food is presented whole it is symbolic of completeness. This was perfect as I hope for longevity for everyone who is in my life. Now, I was more than eager when I started out on this challenge. I was going to take it to the limit by pulling my own noodles. A few months ago, I ran across a new (to my site), The Tiny Urban Kitchen. Jen, made it look so easy to pull noodles; I was wilding intrigued. Then I came home early from work one day and decided to lounge in front of the TV watching “bad movies”; you know the kind of day I am talking about. I flipped around and there in front of me was a sign – Ramen Girl. A silly movie about a girl who learns to make noodles. There were two signs – I needed to make noodles. I started this recipe the day before I planned on serving it as I wanted an insanely delicious beef broth. I decided to not only use beef shanks as I do in my traditional beef stock but I added sweet marrow bones as well. I slowly roasted the beef bones and marrow for a few hours, before adding any vegetables. Then I continued to roast everything together until lightly caramelized; it smelled heavenly. Then I took my trusty dutch oven out of the oven and simmered on the stove top with star anise and water for a few more hours. It really was insane. I could barely stop tasty. This stock recipe does take a while, so plan ahead; well worth every last drop. For the noodles, I used Jen’s recipe, which is fairly simple. I did not use a bread machine and used the mixer instead. The dough came out perfect; the texture was really nice and the gluten was very evident. I was smiling. Then I started the pulling process, I mean it looked so easy from her video, I was overconfident. I even recruited a couple unwilling people to help with making the noodles, this was going to be fun; slapping dough, pulling, slapping, pulling. All I can say is that my confidence was bigger than the mission and it was a good thing we had purchased fresh made Chinese noodles; otherwise, I would be serving you unlucky broth for lunch today! Whether you pull your own noodles or buy them made, this dish is delicious and perfect for a very lucky lunch. Enjoy! Be sure to check out what others are serving for “Let’s Lunch”. Heat olive oil in a large wok. Add the garlic and lightly saute for 3 minutes. In batches cook the squash, carrots and boy choy. After cooking each vegetable, set aside and go onto the next. Bring a pot of water to boil, cook the noodles for 2 – 4 minutes, according to package directions. Drain. Rinse with cold water to stop cooking. Toss lightly with fingers, to get remove excess water from the noodles. In the wok, which should still have a slight film of oil (if not add a slight drizzle) add the red yuzu kosho; heat over medium-high heat for 30 seconds, while stirring. Add the noodles, gently toss with a wooden spoon for about 30 seconds. Remove from heat. 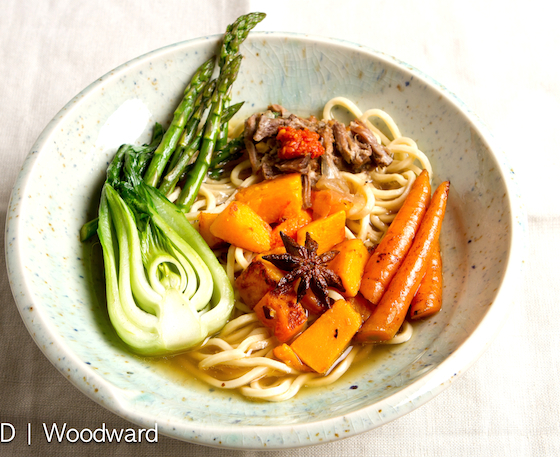 In an individual serving bowl, put a handful of noodles, top with some of the vegetables, then ladle 1 cup of broth over the top as well as some of the meat. Serve with additional red yuzu if you would like it to be a bit spicier. 3 Responses to "Lucky Beef Noodle Soup"
I have a recipe similar that we make using rice noodles. The addition of the star anise makes all the difference! Sorry your noodles didn't turn out. That looks so beautiful! Love the assortment of veggies.